The German Shepherd originated in 1899 in Germany, as a herding and guard dog. The first German Shepherds, as we know them today, were shown in the US in 1907 and recognized by the AKC in 1908 where they remain one of the most popular breeds due to their loving nature, high intelligence and devotion to family. German Shepherds can be any color including black and silver, all black, and all white, but the black and tan coloring is the most popular, and the one people think of as the breed standard. Their double coat is thick and requires regular brushing, and they range in size from 22 to 26 inches at the withers. Due to their loyalty and high intelligence, the breed is used today as therapy dogs, dogs for the blind/handicapped, police dogs, obedience, agility, and show. 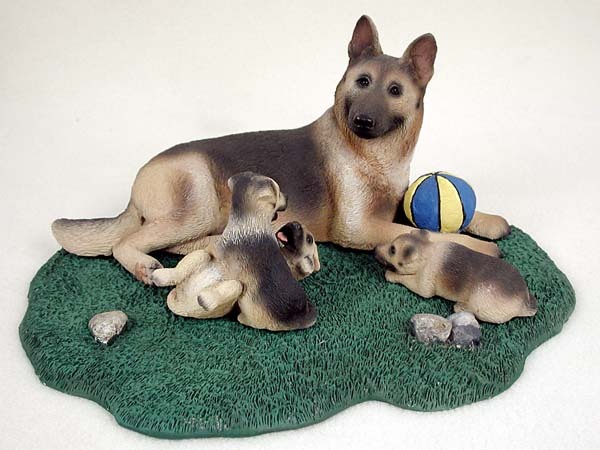 The Mom and Pups Figurines show a mother dog with several puppies in a loving family scene. Each scene is made of hand painted stone resin for years of enjoyment. These come assembled, in an individual boxed.